We are the league that takes you places!! Rally in the Valley - Pennsylvania! Congratulations to the Knuckleheads for placing 17th out of 258 teams at Rally in the Valley in Pennsylvania April 12 through 15, 2018! The team made it to the top of the Platinum Board with three 4 to 1 victories in the Round Robin! The Knuckleheads were the 2017 State Champion team. With TAP Nationals in Vegas, we awarded this team with a trip to Philadelphia to compete in Rally in the Valley! Way to represent guys! 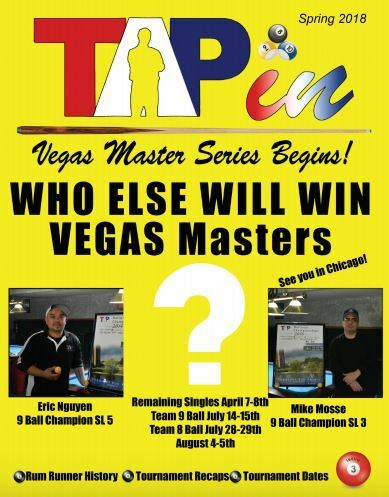 Click here to see the latest information on the 2018 Vegas Masters! What a great weekend of tournaments to kick off an exciting time of year with MORE great Tournaments! 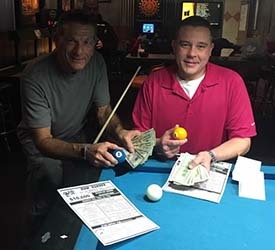 We started on Saturday, February 24, 2018 at 9:00 AM at the Rum Runner with our sold out TAP on 9-Ball Doc Hill Qualifier and Warm Up tournament. We had a full field of 32 and the final winners announced by 7:30 PM! Thank you to all the players and helpers. A big shout out to Connie Foschi who did an amazing job of keeping things on track and running efficiently! It was a full, exciting day of play with much of it streamed via TAP Las Vegas Facebook page. We had a 50/50 raffle to help support our junior tournament. Thank you to everyone who contributed! Our big winner was Butch Peacock who graciously donated the $105 he won back! We raised $210 for our junior’s tournament fund! Thank you to everyone! 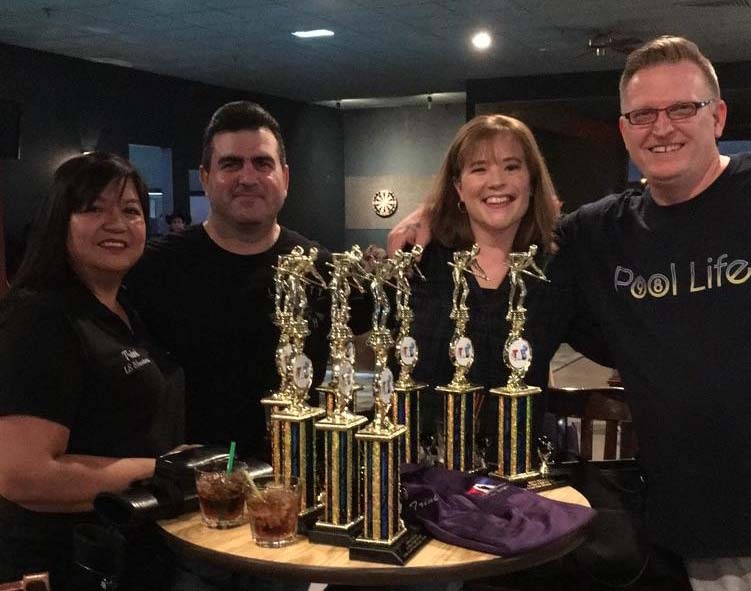 Additional prizes were awarded: a bottle of Cannella Cinnamon Cordial from Cannella Spirits was won by Joe Klimcheck, TAP Vegas Strong Polo to Fred Sistilli, A SporTek TAP Polo to Adam Roberts , a Scott’s Speedy Tees gift certificate to Eric Nguyen and more! 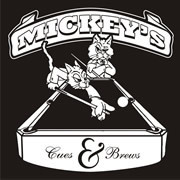 We were at Mickey’s on Sunday with a wonderful group of ladies competing in a 9-ball tournament for cash and a couple of sold out spots to the annual Western Women’s 9 ball Charity Challenge! Congratulations to all the winners, helpers and contributors of this event! Fun was had by all. 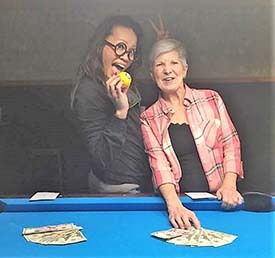 We did a beautiful ladies cue (from Chappell Billiards) raffle with the proceeds also benefiting the junior tournament fund. The cue was was won by Linda Barton, who happened to be having a birthday! Additionally, we had a wonderful array of food from the potluck, including a plant based taco bar! Happy New Year to all of our Las Vegas pool community players! We wish for 2018 to bring you peace & personal growth limited only by your imagination! This month marks our one year anniversary as your TAP League operators!​ This past year brought about many unexpected and wonderful events that have made this journey quite the roller coaster ride with many thrills, twists, and turns. We have learned so much! ​ We are extremely grateful for each and every experience and all of you that make up this wonderful community we are all a part of. 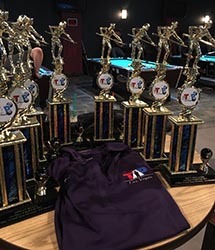 We have a great year planned with many new and exciting pool playing opportunities to include the upcoming Vegas Masters 8-Ball and 9-Ball State Championship Tournament Series where we will be awarding nearly $20,000 to send players and teams to Chicago!​ Yes, we will be going to Chicago and look forward to taking you with us! We are the league that takes you places. 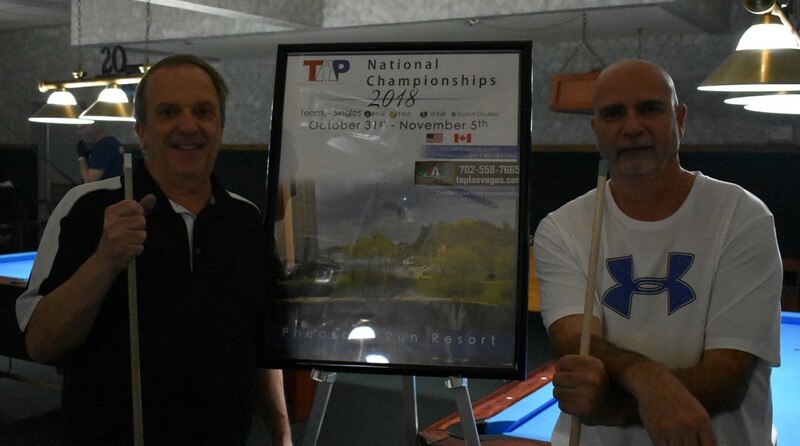 Check out our pool tournament schedule to see what else we have in store for you! We appreciate you and look forward to a whole new year and three great sessions of pool playing bliss! If you are not playing and would like to or just have questions, please call us at 702-558-7665. 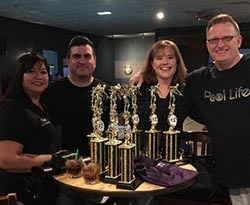 Over $30,000 in cash and prizes were awarded and over 100 players competed for fun and cash at our Rally in the Vegas Valley on January 7 & 8 at the Las Vegas Cue Club! Rally in the Vegas Valley events are held at the end of every session. This is where our players are awarded for their excellence during the session, teams are awarded cash (all of them! ), we draw for the break cues (8 and 9-ball breaks and break and run earn players tickets). 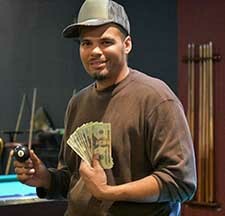 We host several 8-ball and 9-ball tournaments by skill level where players come from all over the city to compete. These always provide a fun weekend for our members! 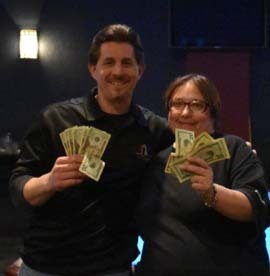 Break Cue raffle winners are Vince Goecke from Wednesday night Mcdermott & Bert Takata from Wednesday Griff's. Vegas Masters team wild card draws were made. See if your team is qualified! A very special thanks to everyone who came out to join us and to the Las Vegas Cue Clubfor hosting our event.